I’ll be covering what the problems teach, how to solve them, and some common pitfalls and what to do about them. We use the BBC micro:bit because it’s a relatively cheap way to get a physical device to experiment with and learn about. In this age of the Internet of Things (IoT) understanding how physical devices work is really important. 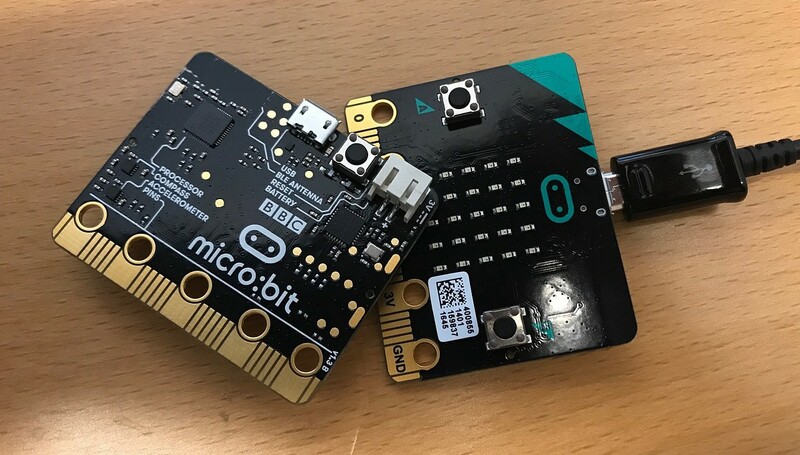 The micro:bit offers an easy entry into IoT and provides students with a more tactile experience. These problems are great for kids from grades 5–8 and covers content from the Australian Curriculum: Digital Technologies including: ACTDIP019 and ACTDIP030. It may be a bit difficult for younger kids, but with sufficient help they should be able to do it. Morse Code is a method of sending text. By sending combinations of short and long signals, you can send text to someone else. These signals can be sound, or electricity, lights, or even blinking your eyes. On the micro:bit we’ll use lights, showing the code on the display. Here’s an example. What does it say? The answer is at the bottom! Let’s start with the Transmitter. This problem is the simpler of the two, and really serves to reinforce how to use the micro:bit radio. Let’s start by importing the standard micro:bit library, as well as the radio, and we’ll turn the radio on too. On our transmitter, we’re going to send a short signal (called a dot) when the A button is pressed, and a long signal (a dash) when the B button is pressed. We’ll need to use a while True: loop here. This ensures that the micro:bit will keep checking for button presses forever. Inside the while loop (where the ... is) we’ll need to check if each button has been pressed. We can do this with .was_pressed(). If they have been pressed we can use radio.send('dot') or radio.send('dash') to send our Morse Code. That is the whole transmitter program. 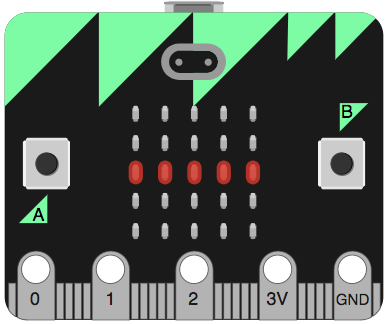 It’s not too long, and is a good level of complexity for someone who’s written a couple of micro:bit programs and is looking to learn to use the radio. This program covers more topics than the transmitter does. In addition to the radio, and a while loop, the receiver uses the music library, displaying images, and sleep. Again, let’s start with some imports, turning the radio on, and our while loop. The only difference from last time is that we’re also importing music . To receive a message on the radio, we can use radio.receive() to get messages from the other micro:bit. We’ve got to remember to assign it to a variable, so we can use it later. Let’s set up an if and an elif to check if we received a "dot" or a "dash". When we receive "dot", we want to display a dot. Just the middle light in the 5 x 5 display. To show something on the display we need to use display.show(...) and replace the ... with an image. A micro:bit displaying a “dot” it’s received. Each chunk of 5 numbers is one row on the display, from top top bottom. Each number can range from 0 to 9, and says how bright the LEDs should be. This image above is the image we want to use for the dot. Just a single LED lit in the middle of the display. For the "dash" we want to display the whole middle row lit up. In addition to showing an image, we want to play a note as well. For this we can use music.play(...), which gets given a string describing the note, e.g. 'F5:1'. The F5 is the note and octave we want to play, and the 1 is how long we want to play it for in beats. We’ll use this note for our dot, and we’ll do the same for three beats (F5:3) for our dash. After we’ve played these notes we want to clear the display, and sleep for 300 milliseconds to give some time between each of the dots and dashes. Most of the tricks here are in the receiver, so we’ll focus on that. The first trick is to save radio.receive() as a variable. If you don’t do this, and instead use if radio.receive() == 'dot' and elif radio.receive() == 'dash'. You’ll find that it won’t work correctly. What’s happening here is that each time you use radio.receive() it gets a new signal from radio, which means that you’re missing incoming data. Another big trick is the images. These big image strings can be confusing, so don’t stress if you or your students have difficulty. Each number sets the brightness of 1 LED on the micro:bit, and the numbers are grouped by row. Experimenting with showing different images should help with this. The last thing to note is that the display.clear() and sleep(300) need to be in both the dot and dash sections. If it’s after the if elif section, you’ll find you’re only able to receive messages sometimes, since the receiver will sleep for 300 milliseconds every time it checks for a message, not just after it receives one. I hope you found this helpful. If you have any questions about this, or other Grok Learning problems you’d like us to cover, let us know in the comments below. Check out our other micro:bit courses here!